Tiffany Barnes Talley is the owner of All Things Canine Behavior Consultations. She has a Diploma of Canine Behavior Counseling from American College of Applied Science. She studied Biology and Psychology at Oklahoma State University. She started the business in 1995. She spent seven years as a Primate Trainer and Keeper at The Tulsa Zoo. She is a member of Dalmatian Assistance League of Tulsa. She has worked with canine rescues for over fifteen years. She is an Associate Member of International Association of Animal Behavior Consultants. Tiffany held a 4.0 GPA at ACAS. She studied Animal Learning, Canine Behavior Treatment and Modification, Companion Animal Nutrition and Wellness along with Field Studies and Residenciesin Florida. She has fostered and adopted out many dalmatians and other breeds in the Tulsa area. Tiffany holds free classes for Sapulpa Shelter and works to adopt the dogs to great homes. She also donates her services to Lab Rescue OK, Animal Aid, Sapulpa Furry Friends, GI Wishes and STAR: Save Train And Rehabilitate Program. Tiffany taught many obedience classes in Tulsa and aided in teaching a Novice I class at Tulsa Dog Training Club. Tiffany has three rescue dogs: Cooper the Vizsla, Zoe the Pit Bull and Tigger the Pit Mix. 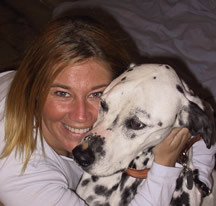 She has owned, fostered and cared for many Dalmatians. The beginning of their lives may have not been the best, but we do not dwell on that! The rest of their lives are active, enriching and wonderful!